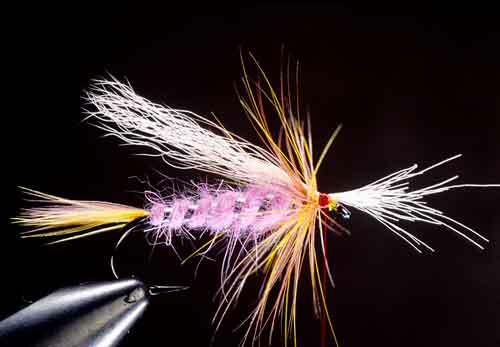 In the Borden Special Tying Steps (Part 2), Skip shows you the pattern for this popular sea-run cutthroat fly, and shows you how to tie it, step-by-step, with clear and easy-to-understand instructions. Hook: Heavy wire, 1X or 2X long, sizes 12-6. 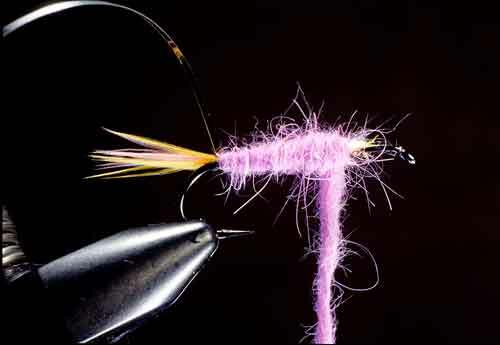 Tail: Fluorescent-pink and -yellow hackle fibers, mixed. Rib: Flat or oval silver tinsel. 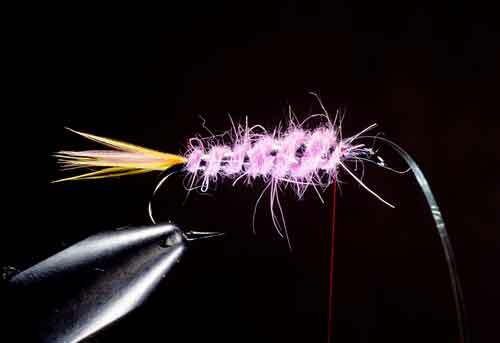 Hackle: One fluorescent-pink and one yellow. 1. Start the thread about three quarters up the hook's shank. 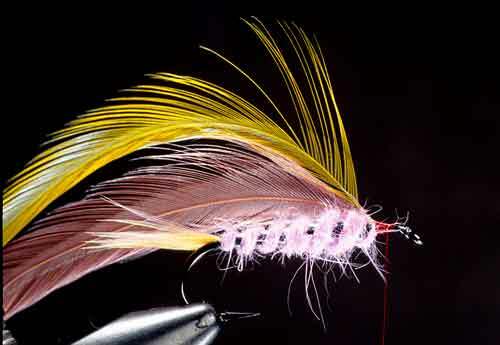 Strip off and mix fibers from a yellow and a fluorescent-pink hackle. Try to keep the tips of the fibers even. Bind the fibers three-quarters up the shank; then spiral the thread down fibers and shank to the hook's bend. The tail's length should roughly equal 1 1/2 times the hook's gape. 2. 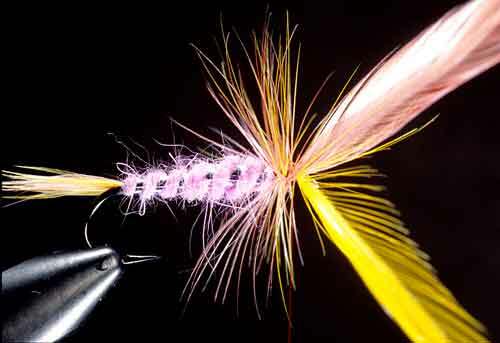 Trim the butts of the hackle fibers closely. Bind some silver tinsel at the bend (and up the shank, if you wish). Trim the end of the tinsel. Dub a full body up three-quarters of the shank. 3. Spiral the tinsel forward over the body in five to eight ribs. Bind the end of the tinsel at the front of the body under tight thread-turns. Trim the end of the tinsel closely. 4. 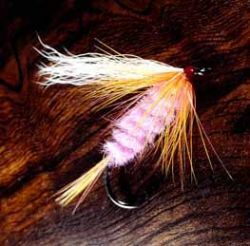 Find one fluorescent-pink and one fluorescent-yellow hackle, each with fibers about as long as the hook's shank, and strip the fuzzy fibers from the base of each. Bind the hackles, together, to the shank at the front of the body. Trim the hackles' stems closely and cover the cut ends with thread-turns. 5. With the thread hanging just back from the hook's eye, wind the hackles forward, together as one, in two to four turns. Bind the tips of the hackles under tight thread-turns; then trim the tips off closely. 6. Comb and stack a small bunch of calf tail. Bind the calf by its butts atop the hook, just behind the eye. The tips of the calf should project back low, to about the middle of the tail. Trim the butts of the calf closely, to a taper, bind them with thread, then build and complete a thread head. 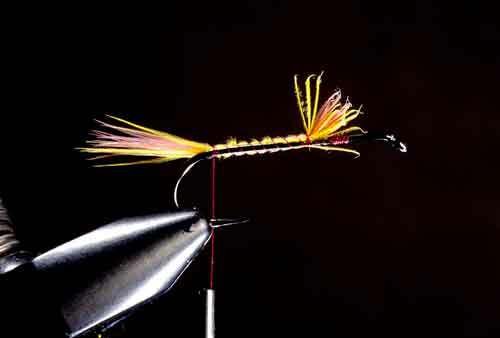 Pinch the fly where you wrapped the hackles to force the fibers to sweep back, if necessary. Coat the thread head with head cement. And there it is...the Borden Special completed. In The Borden Special, Part 1, Skip discusses the specifics of this great fly for sea-run cutthroat trout—the elusive inhabitant of the Pacific Northwest.